The Pittsburgh City Firefighters Union and City Management representatives have in essence agreed to implement a new drug testing policy. The Pittsburgh Post-Gazette reported that the proposed testing policy will likely include "random drug tests, terminations of repeat violators and a fairer playing field when discipline is disputed." Pittsburgh Mayor, Luke Ravenstahl has high regards for the policy as he recently placed his stamp of approval on it. This year was an eye-opening year for the city of Pittsburgh as two Firefighters were involved high profile drug related incidents. Firefighter John Connors: The city tried to fire Connors after a guilty plea to drug possession only to have their decision overturned by a firefighters tribunal. The tribunal returned Connors to the field as they deemed the city improperly demanded a drug test. Firefighter Vincent Manzella: In support of his heroin addiction, Manzella would call in false alarms to empty out his station and then burglarize the firehouse. Manzella resigned and his criminal case is pending. Michael Huss Pittsburgh's Public Safety Director stated that, "There are a lot of firefighters that don't want to work with firefighters that are doing drugs. The new policies will begin to start to build confidence back up that our employees are clean." The city-and-union committee will now have 90 days to work out a random drug and alcohol testing policy. Mobile Medical Corporation (MMC) was recently chosen to provide comprehensive on-site medical services to SNC Lavalin's Astoria Energy II new natural gas power plant in greater New York City. MMC's industry pioneering on-site nursing and first aid stations will be responsible for administering initial new hire safety training, providing first responder medical treatment and conducting pre-employment and follow up substance abuse testing and biological monitoring for the project. SNC-Lavalin is one of the leading groups of engineering and construction companies in the world, a major player in the ownership of infrastructure, and in operations and maintenance services. The SNC-Lavalin companies have offices across Canada and in 35 other countries around the world, and are currently working in some 100 countries. Mobile Medical Corporation (MMC) is a premier provider of quality substance abuse testing and occupational healthcare programs nationwide. MMC offers complete and compliant packages of industry required physical exams and bio-monitoring solutions and when it comes to onsite nursing and first aid station management in the construction field... MMC is the standard bearer! MMC also offers a unique suite of worker credential tracking solutions which can strategically manage all of your employees testing results, trainings and industry certifications. Celebrate National Drug-Free Work Week MMC Style! Mobile Medical Corporation (MMC) began National Drug-Free Work Week 2009 on Monday by participating in The Union Construction Industry Partnership's Kick-Off Breakfast. MMC's Vice President Marianne Karg who played an integral part in hosting the breakfast claimed that the event was a great success. National Drug-Free Work Week is an annual campaign led by the U.S. Department of Labor’s Working Partners for an Alcohol- and Drug-Free Workplace program. The "Kick-Off" Breakfast was host to several guests including U.S. Department of Labor Policy Coordinator, Elena Carr. Also speaking at the engagement were Robert Banks of the Ironworker Management Progressive Action Cooperative Trust (IMPACT), Wayne Creasap of the The Association of Union Contractors (TAUC) and Jim Joyner of Jim Joyner and Associates, LLC. 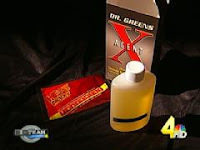 A report from Channel 4 news out of Nashville, TN has brought to light the use of synthetic urine for cheating drug tests. The fake urine is manufactured and sold in novelty and gag shops and is the newest weapon that drug users are turning to to defeat drug testing. The manufacturer's disclaimer on the packaging states that the product should not be used for unlawful purposes... Well, one wonders what other purposes synthetic urine would be used for if not for cheating on drug tests. "I've never had anyone who did it right fail, including me." ... "Mine went through a lab, and I got my life insurance. I'm telling you, this stuff is amazing." "I've got some synthetic urine, if you don't mind sneaking it in there, that passed every test that's thrown at it." "Your synthetic would be the best way to go,"
Drug testing companies and authorities are catching on to this new rash of cheating. If a user is caught it is usually during the collection period as the temperature of the fake urine is usually not body temperature. Companies are cathcing on and can now analyze to see when the fake urine has been used in drug tests. A laboratory in Nashville concluded that in a sample testing performed on a target group - synthetic urine was used nearly 80 times in the past three years to try and beat drug tests. Marianne Karg, Vice President of Sales and Marketing at Mobile Medical Corporation (MMC) writes in the fall 2009 edition of The Construction User magazine that "Addiction is an equal opportunity employer." The article titled "Eliminating drug and alcohol abuse from your workforce" is an informative article that delves into substance abuse testing in the workplace. To read the article click here and scroll to page 14. By strapping a condom of another person's urine to his leg and using a hidden razor blade to cut the condom and access the urine is how Justin Head planned on passing his drug test. Head was caught even before he was able to enter the testing area. He was arrested when an official in the probation department caught him with a piece of razor blade he had smuggled into the courthouse in his mouth. Sheriff's Sgt. Michael Cisner said "He was going to cut (the condom of urine) open with the razor blade and use it as his sample." Court records indicate Head was required to undergo the drug test as part of a court supervision sentence he received last year in a 2008 misdemeanor marijuana possession case. According to the Chicago Daily Herald a judge set Head's bond at $10,000. He is scheduled to return to court soon. The Federal Government is launching a new national offensive against companies who hide workplace injuries in order to avoid safety inspections. The new program will scrutinize industries that are categorized as dangerous and who have an unusually low injury reporting statistic. Jordan Barab, The Occupational Safety and Health Administration's (OSHA) acting chief, told the Observer. "Accurate record-keeping can really determine whether workers live or die in the workplace, or be healthy or unhealthy," Barab concluded, "We want to make sure that OSHA is actually targeting its resources where they need to be targeted." Each year approximately 5% to 20% of the U.S. population contract some level of the seasonal flu virus. This year with the prediction of a "Swine" flu outbreak those numbers could rise. Besides inoculating your workforce, MMC would like to offer the following tools to help keep your workplace healthy during flu season. Click below for free downloandable materials for your office and jobsite! Minnesota Department of Health - Cover Your Cough! Mobile Medical Corporation (MMC) is a premier provider of On-Site Drug Testing, Occupational Healthcare solutions and First Responder Nursing and First Aid Station management. Mobile Medical Corporation (MMC) has scalable services to fit any testing need.